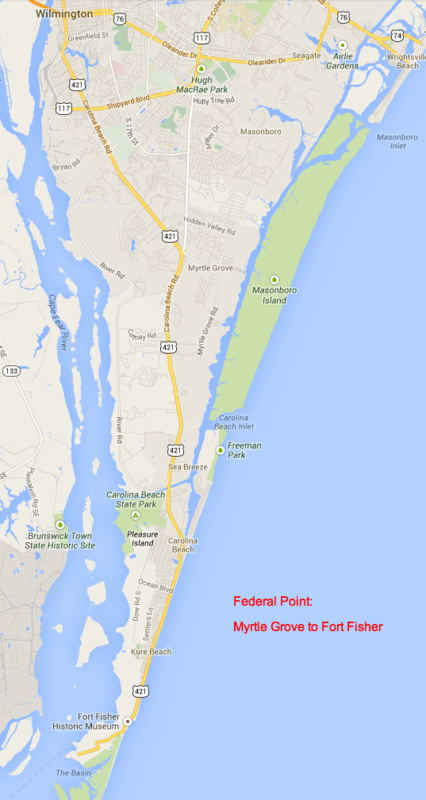 The Federal Point Historic Preservation Society is named for Federal Point Township, which makes up a large portion of New Hanover County southward of Monkey Junction, bounded on the west by the Cape Fear River and on the east by the Atlantic Ocean. The peninsula includes many neighborhoods along River Road and Mrytle Grove Sound including Seabreeze. South of Snow’s Cut lies Carolina Beach, Wilmington Beach, Hanby Beach, Kure Beach and Fort Fisher. Wilmington Beach was recently annexed into Carolina Beach, and Hanby Beach was annexed into Kure Beach. Even though some of these communities are relatively new, this whole area is rich in history from prehistoric time, when native Indians frequented the area, through the period of colonization and early settlement, the Civil War and both World Wars. The earliest mention of Federal Point by name appears on a map engraved by Joshua Potts around 1777. However, it is generally accepted that it was named during the 1790’s in honor of the new Federal Government and the ratificaion of the United States Constitution by North Carolina in 1789. In 1861, with the onset of the Civil War, the Confederates changed the name to Confederate Point, but it was changed back again in 1865 with the fall of Fort Fisher and the occupation of Wilmington.